Urban designers draw from architecture, landscape architecture, community planning, engineering, engagement, social psychology and ecology, fusing many elements in the creation of beautiful, vibrant and connected communities. At MODUS, our urban design practice consciously takes a human-centred approach to city planning and design, where the buildings, streets and open spaces are seen mainly as places for people. Working closely with a range of community members helps us to identify a range of needs, to clarify values and priorities, to tap into shared history, and to build interest and ownership in project outcomes. Place-making takes the practice one step further: by honouring the character of local places and people, we capture the genius of place and deliver more restorative, socially cohesive, ecologically healthy and economically prosperous solutions. The end result is always a more context-sensitive, creative, and well-supported plan or design. POWERFUL SOLUTIONS: better-informed plans and designs make for better-fitting, context sensitive and longer-lasting solutions. Close collaboration with a range of stakeholders increases understanding of both issues and opportunities. EDUCATION, INTEREST AND OWNERSHIP: plans and designs succeed as they build community and stakeholder capacity to engage meaningfully in the urban design process. RISK MANAGEMENT: participation and co-creation foster better understanding of and public support for design and planning outcomes. We help manage difficult issues proactively by co-defining the “what”, “who” and “how” of engagement-led design efforts. Other benefits flow from timely and effective outreach to stakeholders, networks, the general public, and media. Engaging stakeholders in the expression of a clear, concise and compelling vision at the onset of a project builds trust and understanding, as well as shared interest and ownership in project outcomes. Initial visioning materials support program/design development, help to direct analysis, and establish constructive criticism as part of the iterative design process. Photos of Favourite Places and “Love Letters”: By describing the qualities of their favourite places in the world, participants intuitively communicate their wishes for the future. Love letters requires participants to write a letter to the master plan or future site in question. In doing so, participants distil their aspirations by directly addressing the future place as the object of their affection. Bumper Stickers & Manifestos: ‘Bumper stickers’ are a great way to distil the essence of a project’s intentions (in just a few words or even a sentence). These descriptions are short and evocative, giving a taste of what the project aspires to be. Manifestos can be more action-oriented and detailed declaration of intensions for a project, with clearly listed aims and even action items. Engaging stakeholders in a deep and meaningful discussion of “place” (including the exploration of bio-physical, cultural, socio-economic, political and regulatory opportunities and limits) provides a key opportunity to incorporate local knowledge, values and priorities. It also informs the subsequent stage of program development. · Community mapping + Floor maps: Local knowledge is key when designing with and for a community. Floor maps are large aerial photos of a site printed for community members to make place-specific comments. This informs design professionals of informal uses of the space, historical uses, challenges to address, and things needing improvements. Stakeholder interviews + ‘Streeters’: Interviews gather information on who community members are and how they use the places they inhabit. ‘Streeters’, or street interviews, are an impromptu method of getting a more diverse selection of experiences and opinions. Both of these tools can help you “go to them” for input. Experiential Surveys (Photo/Video Surveys and Walking Tours): Community members record their favourite local places and identify what make these places unique and valued. Facilitators can help identify the intangible traits that make them special. Walking tours provide experiential understanding of a site and its context to designers and community members in a shared experience. Engaging stakeholders in the development of “program,” including the full range of uses, events, activities contemplated, and the associated spaces they may require, helps them articulate needs and dream about imagined functions and dimensions of a space. They can ask “what? how much? how big?” without being distracted by imagined form yet still influencing design development and identifying potential trade-offs. Vignette Sketching: At a table with a sketch artist and facilitator, community members describe themselves in their idealized spaces. This highly visual technique emphasizes the experiential nature of design, encouraging participants to describe ideal scenarios for the future use of the space. Through the real-time sketching and annotation exercise, ideas emerge and grow. Engaging stakeholders in a collaborative design process allows them to actively participate in the translation of a vision into tangible form. Skilled designers act principally as facilitators of the emerging shared vision, developing and iterating design solutions within the context of site constraints and opportunities, priorities and identified program. 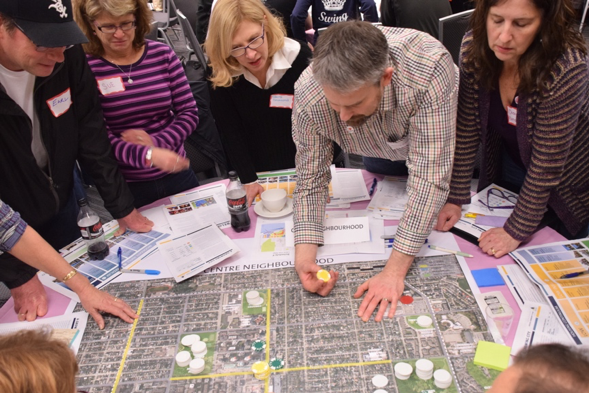 · Charrette: Charrettes bring community members and their expertise into the room as designs are developed, having them to sit alongside subject matter experts and designers. At key points throughout design development, participants contribute ideas and react to design directions. Co-design Workshops: Shifting from the realm of engagement to empowerment, the co-design workshops utilize graphic facilitators and designers to develop designs as directed by participants. Ideas Jam: In an ‘Ideas Jam’, community members directly contribute ideas/designs. Specific methods are tailored to fit the needs/abilities of individual stakeholder groups. One example includes a tournament-style event, where design refinement continues in iterative rounds until a winning design is selected. Engaging stakeholders in thoughtful consideration of design options is key: without rigorous critique – as measured against stated vision, values and best practices – design development stagnates, local communities cannot articulate their support and/or preference, and both understanding and implementation suffer. Open Houses and Online Platforms: To ensure feedback is received from as many community members as possible, open houses and online platforms (e.g. Wayblaze) can be used as a wide-reaching and cost-effective method to share information and solicit feedback. Citizen and/or Expert Lectures and Juries: Presentations and/or public lectures help inform a shared knowledge base to apply within the design exercise. Citizen and expert juries can provide an objective third party review of emerging directions and improve the likelihood of “asking the right questions” about whether a design meets its intended goals, reflects the community’s desires, and results in a workable solution. Active Discourse, Research and Best Practices: Supporting an ongoing local dialogue regarding the built environment helps elevate the discourse and to align values as critical issues arise. Bringing relevant examples of successful past projects to the discussion, as well as listening to concerns and ideas, can educate stakeholders and helps ensure future project success and innovations based on lessons learned and current best practices.